Milks, Racers, and Hank Williams Jr.? 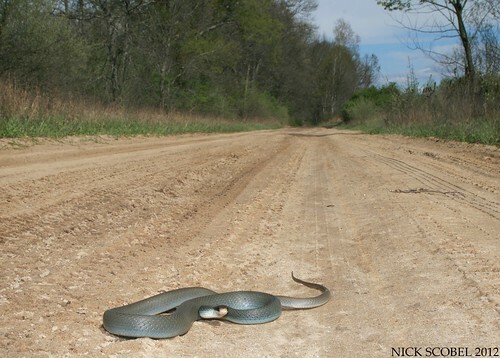 Spring has certainly sprung here in the Wolverine state, and there has been no shortage of snakes over the past week or so. After finding an Eastern Milk Snake a few days ago (read the blog post Late April Lampropeltis), I decided to venture back one afternoon in hopes of seeing a few other species which could easily show up under tin as well. Although neither a hognose or green snake made an appearance, I did find this fantastic milk snake along with four others. An absolutely stunning snake in my opinion, this is by far the largest individual of this species I've ever seen and I would guess it was pushing the 36" mark. Its large size and coloration made it a pleasure to photograph, though I can't decide which of these two photos I like more, opinions? I parted ways with the beast and did not get back out until the weekend when Chris & Matt Boguslawski swung up north on Sunday for a day in the field. 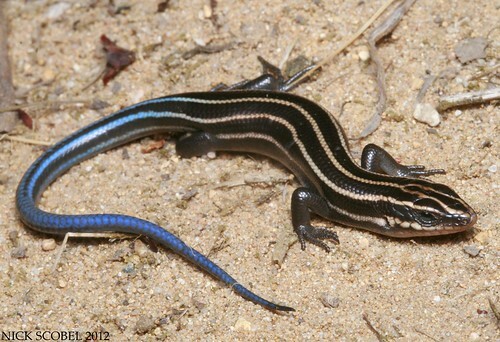 We swung a bit south of CMU and hit up an area I frequent on a regular basis in hopes of seeing some Blue Racers. Less than five minutes is all it took to get our first of 6 in less than an hour. This large adult required quite a chase from Matt & I. At well over four and half feet in length, blues in this size range are always fun to photograph due to their testy disposition. We saw several others in the next hour, but the best find at this site was when Chris flipped this juvenile under a random Hank Williams Jr. CD cover in the middle of an open field, you couldn't make that up if you tried. 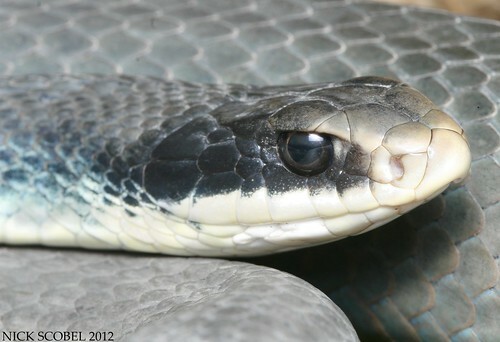 Most of you will recognize this snake as a juvenile racer. But some of you may wonder, why isn't it blue? 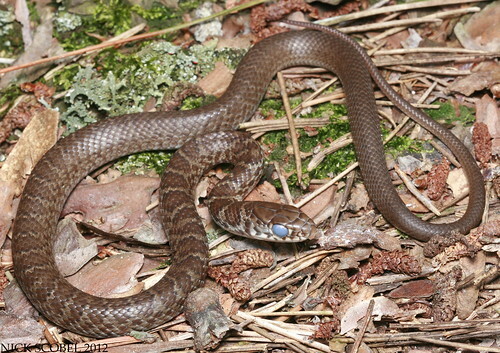 Racers are born to be gray or brown with patterning, which eventually changes as they age. 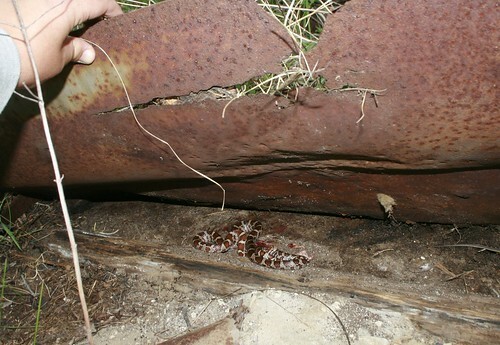 Because they are not as large and fast adults, they have evolved this strategy to help conceal young snakes from predators until they are old enough to escape quickly. We stumbled across a few more racers and then headed back towards CMU to flip some tin. It paid off for the boys as we flipped a few of these beauties. The guys were pretty excited to see these two snakes, as they hadn't seen one in Michigan for awhile just like me up until recently. We also saw a few garters snakes and that was it. We swung out to another area as the sun was going down in hopes of finding my first skink of the year, luckily this lone juvenile was found under a coverboard at about 7:00 PM. It was a great day with the guys and we enjoyed a nice burger at Jon's Drive In here in Mount Pleasant after a long field day. I'm glad they could make it up and would like to wish Matt a happy 21st birthday. 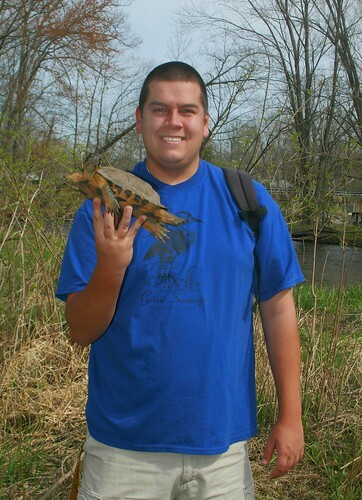 That's all for now, stay tuned as Herping with Dylan comes to Michigan next week! Last weekend, I had some free time and decided to go explore and area I've been meaning to get to for some time on the west side of the lower peninsula. This large tract of state land is a nice mosaic of community types and home to some of the tougher to find species in the state. My hopes for the day were to potentially bump into a black rat snake or box turtle, but that ended up being for another day. A friend pointed me to some wetlands in the area which may potentially hold massasaugas. At my first spot, I struck out on rattlesnakes but bumped into this pretty girl. A sharp looking turtle indeed, this is one of nicest individuals I've seen in the field. 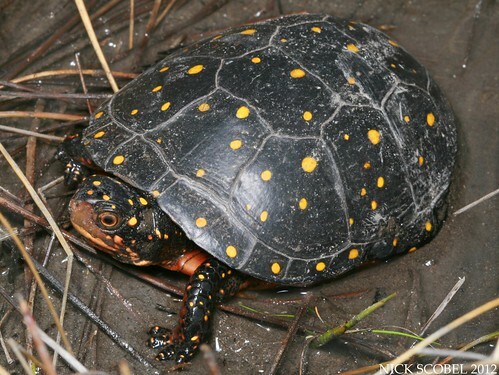 The fen I was walking though was just off a lake edge and similar to some areas I've spotted turtles in the past. 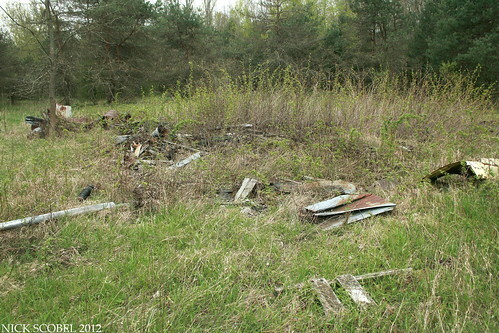 I ended up seeing two more in this small fen and made sure to take some GPS coordinates on the spot. I only managed to snap a quick shot of this young individual as it was burrowing into the marl substrate of the fen. 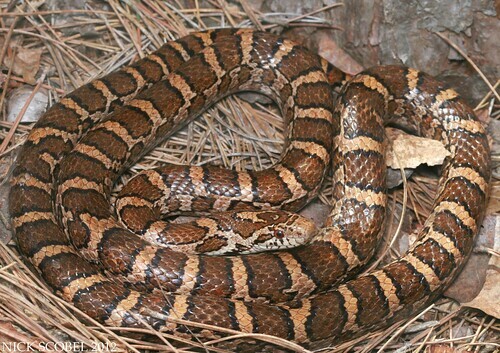 Most of my day was spent driving habitat looking for good area to stop for rat snakes or box turtles. During the afternoon, I passed several roadside buttonbush swamps and some of them held some nice surprises. This particular wetland was loaded with spotted turtles, I likely saw 7-8 in this algae-covered expanse before the buttonbush got too thick. Being used to seeing spotties in super high quality fens and then seeing them in this setting was quite different, but a welcome change. 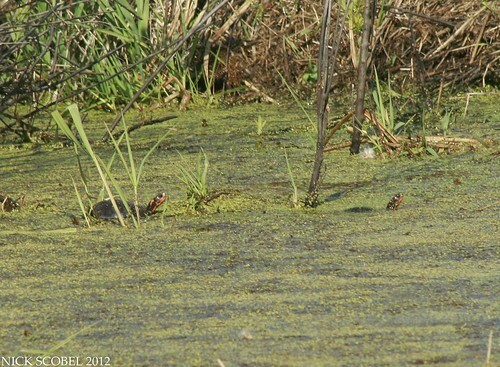 I snapped the best shots that I could from a distance with my telephoto as the turtles stared back at me. I decided to call it a day and start heading back to CMU, however I did pit stop at a small vernal pool one county over to see if there were any spotties out there too. 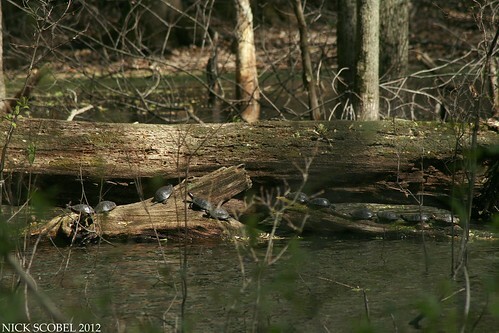 I was greeted with this sight, 11 spotted turtles basking in the same area. It was a fun day indeed, although I did not find my primary target species. But exploring a new area and seeing a species which is imperiled in the state in good numbers was well worth the trip itself, hopefully this is a good sign for this species in Michigan. Sometimes being in the field isn't without a bit of irony. 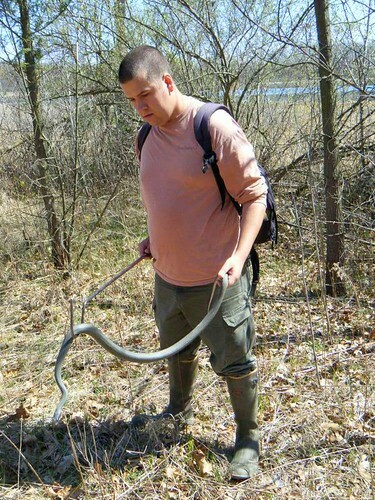 This morning I posted a short rant about a few snake species that have eluded me for a few years in Michigan; the Smooth Green Snake, Eastern Milk Snake, and Northern Ringneck Snake. 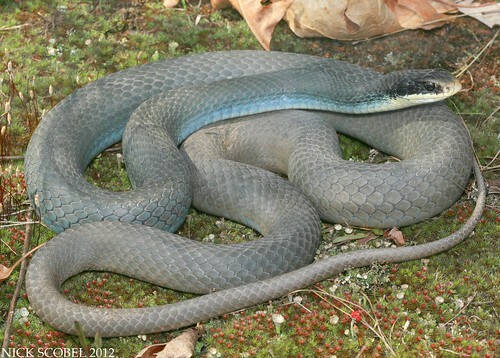 The problem is with these snakes is that they're secretive, and two of them aren't active on the surface terribly often. This afternoon after getting out of class, I decided to go check an area described to me by a friend amid overcast skies. After a pleasant hike along the river, I eventually made it to this clearing. This kind of a place is a herper's dream. 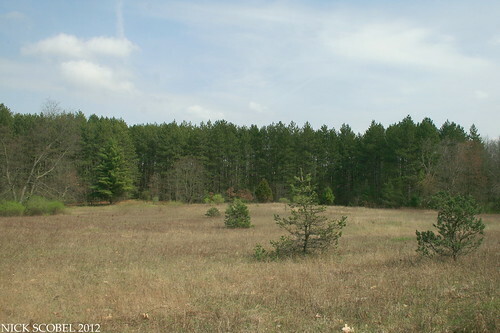 This open clearing has some nice sandy soil and was bordered by some nice forest in the background of the photo and a cedar swamp on the other side. This type of ecotone can be a good bet for a plethora of snake species. I began flipping cover and saw a few small garter snakes, and then I flipped a larger sheet of tin to reveal the prize of the day. 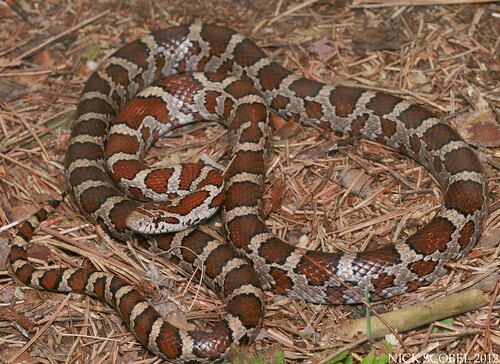 I find it a bit ironic that I had just been whining about not seeing a milk snake in a few years in a post this morning, and then was granted this sight in the afternoon. 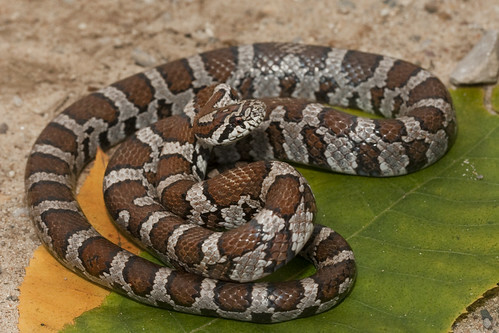 The last time I saw a milk snake in the vicinity of CMU was back in October of 2009, which you can read about in the blog post October Surprises. 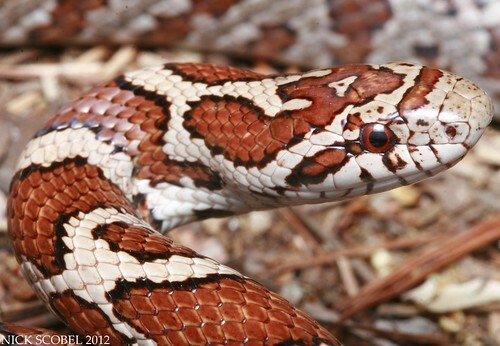 This individual was freshly shed and a stunner for an adult milk snake. Most of the adult milks I've seen in Michigan have been sharper looking that other adults I've seen elsewhere. As the spring continues on here in Michigan, my field time is running out before I head back to the northeast for the summer to work for the U.S. Fish & Wildlife Service once again. It's been an odd spring here in Michigan, but I've still seen some decent snake diversity. However, there are several "common" species which I'm hoping to see before I depart. 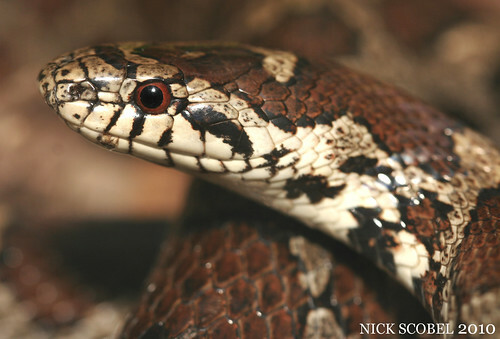 For whatever reason, these snake species can be particularly difficult to find in the state. 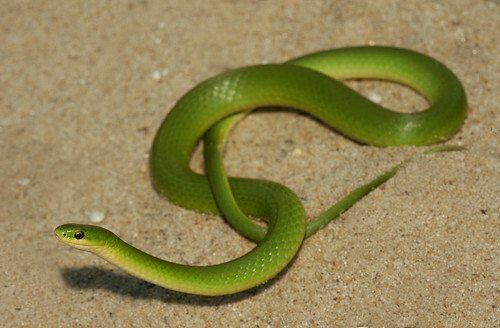 The true gem of Michigan's snake species, the smooth green snake's emerald green color is unique in the state. It was once widespread across the lower peninsula, but seems to have disappeared from much of its former distribution in the state. Smooth greens are insectivores, and because of this diet they are particularly susceptible to pesticides. 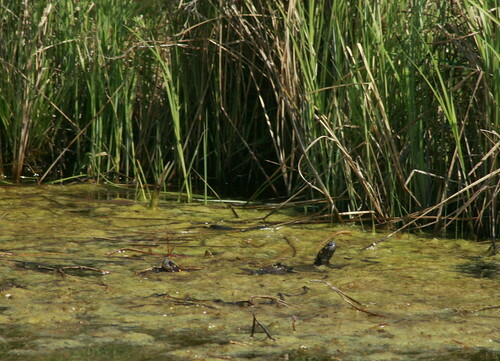 Much of its habitat in the lower peninsula has been reclaimed for agricultural purposes and in turn pesticides have been widely used, likely contributing to its decline. It can still be found in pockets in the northern lower peninsula and in the upper peninsula. 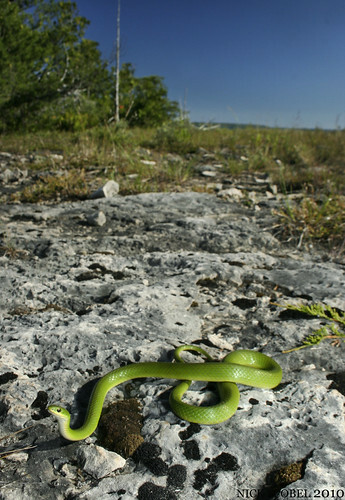 Smooth greens inhabit a variety of habitats which include meadows, prairies, conifer swamps, and coastal alvar habitat. 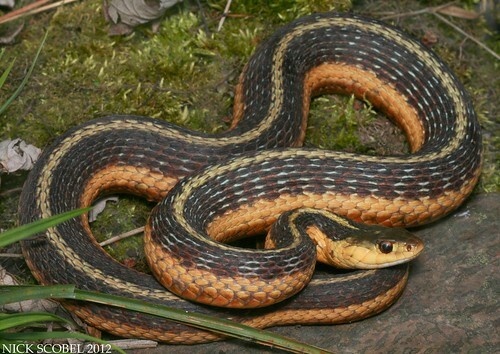 I'm hoping to head north in early May to track down one of these gems and the two other snake species which seem to be very elusive here in Michigan. 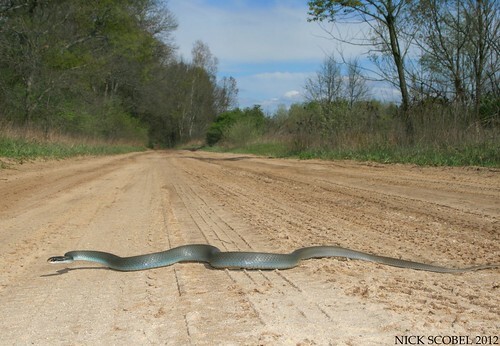 This small, colorful snake is another mystery here in Michigan. 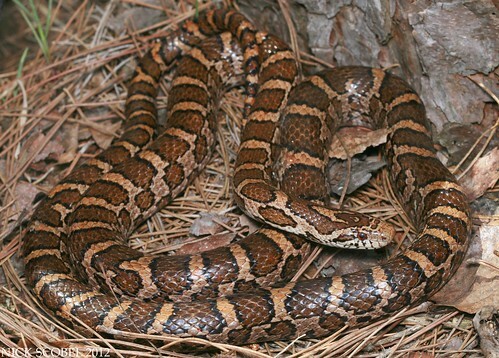 It is extremely common in states to the south of Michigan, but can be extremely difficult to find in the lower peninsula. Even more mysterious is that it can be found in huge numbers on some of the coastal islands along Michigan's coasts, I once saw more than twenty under a single coverboard on an island in Lake Michigan. 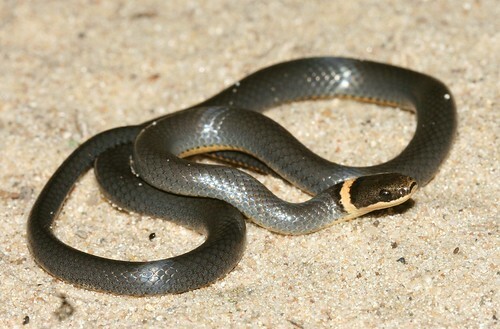 Ringnecks snakes are easily distinguishable from other Michigan snake species. 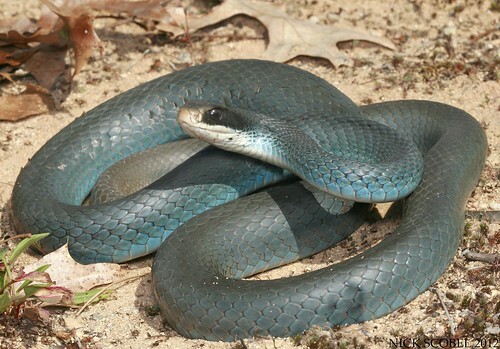 They are small in size (13" max TL), have a slate-blue colored dorsum, a bright yellow ventral surface, and a light colored sing around the neck with a cream colored chin. Ringnecks are found in a wide variety of places and are most readily found under surface debris in damp locations. They're usually associated with Redback Salamanders, one of the primary staples of their diet. A friend of mine has seen a few within a short drive of CMU, but I have not been so lucky to see one on the state's mainland. 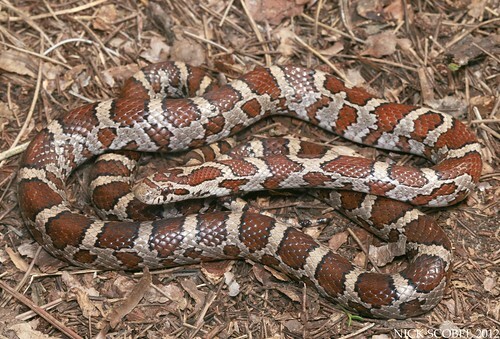 A secretive but relatively common snake species, milk snakes are likely found throughout all of Michigan's lower peninsula. 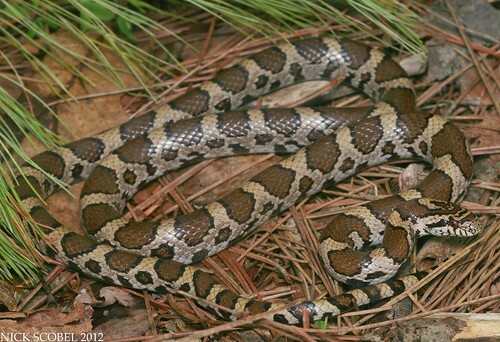 Like other snakes from the genus Lampropeltis (Kingsnakes & Milk Snakes), the eastern milk snake is a constrictor and a lover of rodents. Milks are an interesting snake species in that you never know where you're going to find them. I've found them in many different environments and situations. I've cruised them at night in the mountains of Tennessee, flipped them under tin and trash, found them on the crawl, and found them basking in the early spring. I haven't seen one in Michigan since 2010 and am hoping to change that soon. It's been a very odd spring here in the great white north. After a week and a half straight of 70s and 80s near the end of March, we have only had a few days over the 60 degree mark in April. The weather seems to be stuck in a pattern of low 50s during the day and low 30s at night. This has been frustrating as it had made finding snakes quite a challenge, particularly massasaugas. After a few days of rain and cold, the sun finally peaked out on a Saturday afternoon with temps forecasted to reach the low 50s. I wouldn't normally make an effort to find snakes in such cool temperatures, but because of the weather the three previous days I was hopeful that the sun might bring some stuff out. On my way to one of my favorite sites, I noticed this beast crossing the road. It is always a great sight to see one of these on the road without being hit, usually the latter is the most common fashion in which they are seen on or near roads. Encouraged by this big snake on the move in weather with temperatures still in the high 40s, I reached my location and set out. 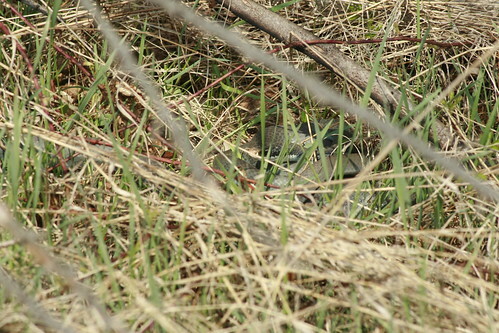 Within a few minutes I head another snake in hand, a smaller adult which was basking near a rodent burrow. After a few bites, I managed to snap a few photos of this snake. 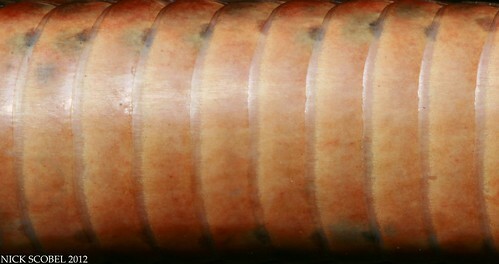 This snake showed some broken scales and other scars, likely due to a predator. However it seemed to be in excellent health besides the few minor knicks on its flanks. 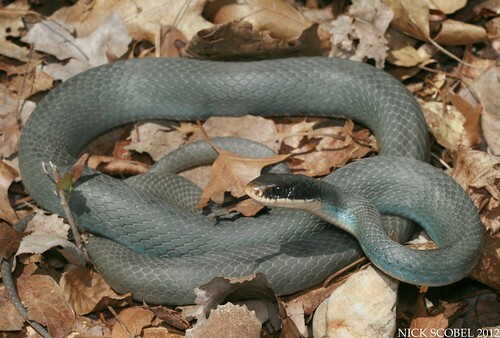 While I was finishing photographing the snake, I heard a characteristic snake rustle and looked to see another Blue Racer periscoping about twenty feet behind me. I quickly left the snake and apprehended the sneaky peeping tom which had interrupted my photo session. 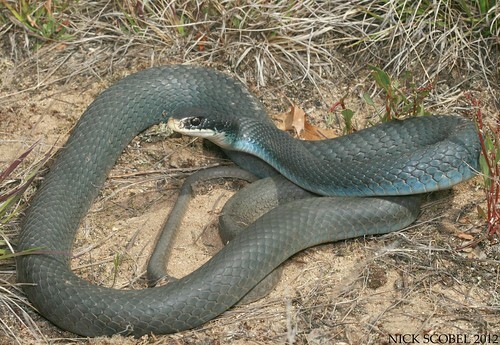 This individual was much more blue than the previous two snakes and had a very noticeable rusty-red snout. After a quick photo session, I headed off to another patch of field within the area in hopes of seeing some more racers or a hognose snake if I was lucky. Although no Heterodon made an appearance today, I heard a noise as I was basking a small tree and looked over to see this staring back at me. I'm unsure whether this snake was basking in the tree the entire time of if I had scared him into it as I was passing by, but I've seen racers exhibit both behaviors in the past. I snapped a few shots and then continued on, less than a minute later I spotted another one basking in an open sandy area. Racers were in so short supply on the afternoon, I ended up seeing a grand total of 7 live and one DOR. I won't complain about seeing this species as they can become particularly difficult to see and get in hand later in the year as temperatures and grasses rise. Although the temperatures were fairly chilly, it didn't stop these guys from getting out for a little sun. I'll close with one of my favorite shots of the year so far. As I was photographing the snake I found crossing the road earlier in the post, it decided to stop in its bath and hold its ground. I love the attitude of this species. Over the past week or so, I've been helping the CMU biology department with frog call surveys in various coastal marshes along the lower peninsula's shorelines. Last night, we surveyed some large coastal marshes along the Lake Michigan coast in Ottawa County. Our first calling point yielded a massive chorus of spring peepers, and a few green frogs and gray treefrogs as well. For those of you haven't been up close to a full chorus of several hundred spring peepers, the sound can be absolutely ear piercing. 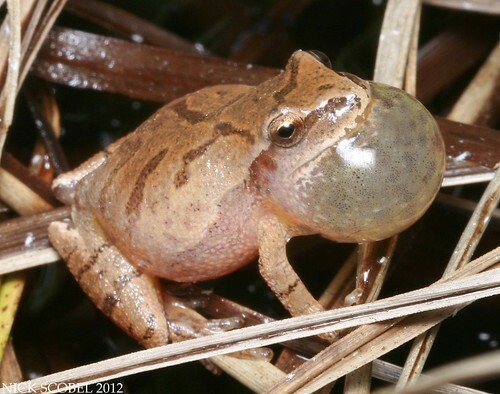 It's amazing that a frog only an inch or two in length can produce such a loud, high-pitched call. My ears were ringing for the majority of the drive back to CMU. I've attached a short video of the chorus as well, enjoy! 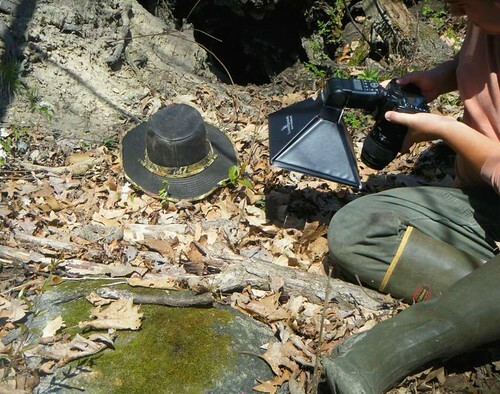 I've been a little back logged in terms of keeping the blog up to date, mostly due to schoolwork and field work with the CMU biology department. 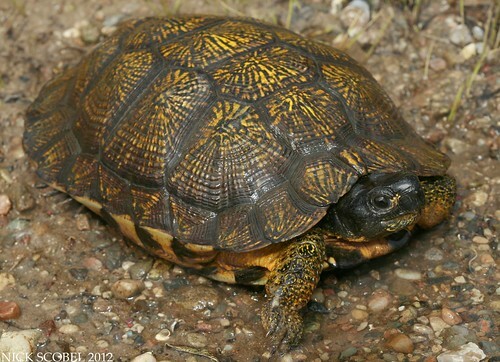 But last week, I had a few hours in the afternoon on a couple days to go walk a stretch of river that I usually do in hopes of seeing some wood turtles active for the first time this season. The sparse cover at this time of year makes them particularly easy to spot basking on decently warm afternoons near the river bank, a few years ago I saw nine of them in a small area with Curtis Hart early in the season. On this day, I was not disappointed and found this big female in a small rocky creek which feeds into the river. I usually don't see females much outside of the spring and fall in Michigan, likely do to their dispersal for the summer months. 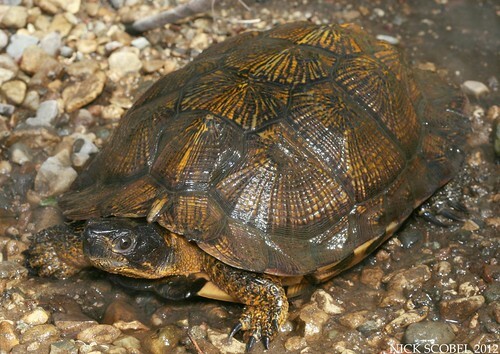 While tracking wood turtles last summer in the northeast, our males usually stuck pretty close to the stream corridor all summer while our females wandered great distances in order to lay their eggs and forage away from the stream corridor for the majority of the summer months. This is likely the same pattern wood turtles here in Michigan follow as well, and these girls won't be moving off until early May. 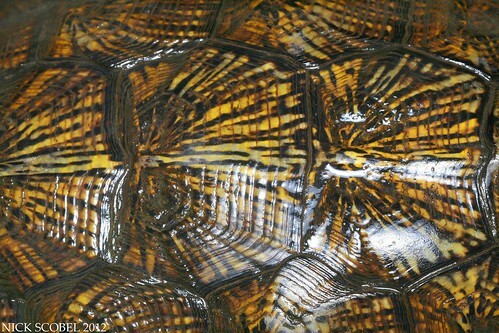 I've stated my opinion of my bias towards the appearance of wood turtles in the western part of their range over those which occur in the eastern part of the range, and this photo illustrates why. 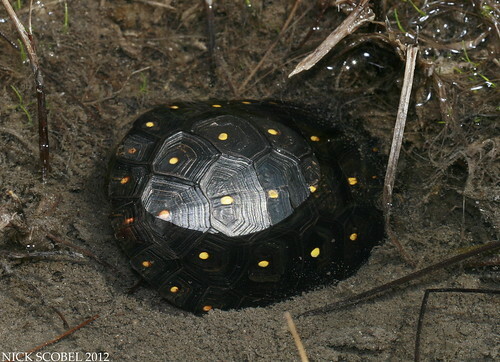 The vibrant, radiating yellow markings on the carapace seem to be more pronounced in the wood turtles out this way. I covered differences between these two variants in this blog post. 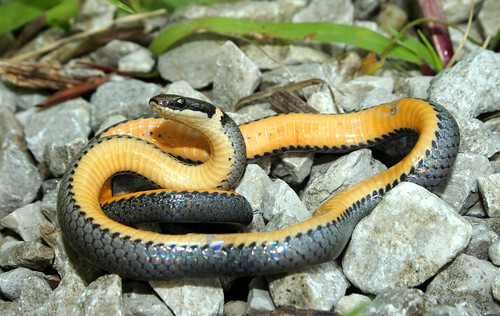 Not too long after photographing the wood turtle, I stumbled across this gorgeous female garter snake. 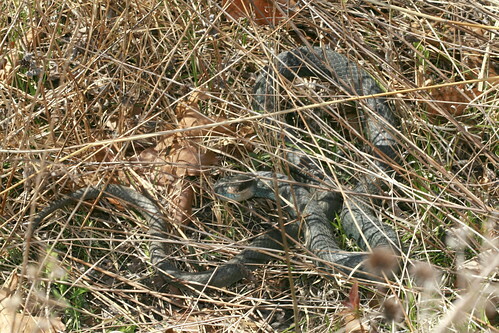 A very large gravid female, well over the 30" mark and pretty ornery for a garter snake, she was certainly impressive. This snake had a beautiful tangerine orange coloration to its lateral stripes which extended onto its completely orange ventral surface. After getting out of class the next afternoon, I decided to return to the same area to check for more turtles out on the move. It didn't take terribly long, as I spotted another large female on the move along a fallen tree near the river bank. After a quick photo with her, we parted ways and within fifteen feet of where she was sitting I spotted another female just coming out of the stream to bask. 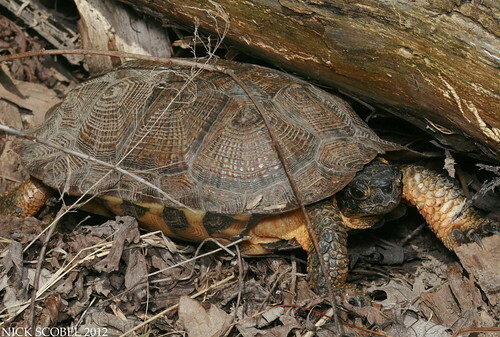 It's not uncommon to see several wood turtles utilizing a small area to bask, while tracking turtles last summer in New Jersey we found four of our telemetered turtles within a small area in early May. This individual was extremely vibrant and the photo does not do her justice. I ended up seeing a total of six wood turtles between a few sites during the week and it seems spring is finally starting to take hold here in the north. I always enjoy seeing this species and look forward to returning to the northeast this summer to work for the U.S. Fish & Wildlife Service on these guys once again. Easter weekend brought the opportunity for me to get out and spend some time in the field with a few friends. Saturday the 7th brought sunny skies and temperatures rose into the low 60s. 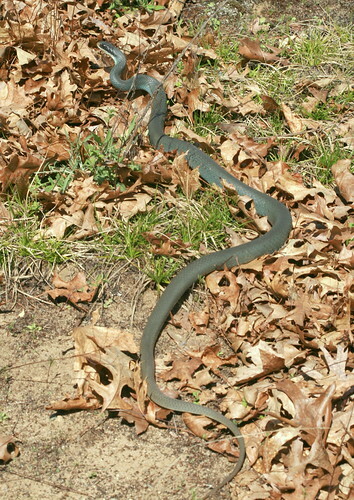 I decided to meet the Boguslawski brothers out at a few sites in Oakland county in hopes of seeing some active snakes. We met around noon as the temps were climbing into the high 50s and it didn't take us long to find our first snake of the day right in the parking lot. A healthy adult, this snake was quite nippy and excited a few spectators who were nearby. 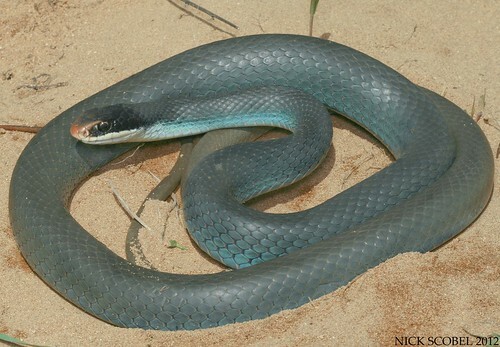 Blue racers are locally abundant, especially on the west side of the state. However their numbers have declined in southeast Michigan due to habitat loss and fragmentation because of urban sprawl and development. We continued on and saw the usual suspects; garters, ribbons, and water snakes. But no rattlesnakes made an appearance right away. Later on the afternoon, we moved into a patch of woods adjacent to some swampland when Colin called that he had a large racer. As we were attempting to capture the racer, Colin almost stepped on this little beauty. A small but surprisingly noise little massasauga with a busted up rattle. 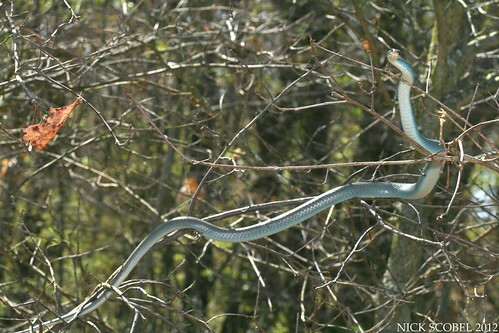 This snake was in a bit of an odd location, a forested hillside maybe 30-40 yards from a fen. There were crayfish burrows in the area however and it would make sense that the snake was probably utilizing the area for overwintering purposes, but I've never seen on in this type of spot in the field. We snapped a few photos of the little bugger and that parted ways. We didn't see any more massasaugas on the day, but managed to see more of the usual suspects and a few amphibian species. As the late afternoon sun began to drop, we got one more look at a nice racer from the area out in an open meadow. It was a slow day in terms of numbers, but a good day in terms of species diversity. We ended up seeing five snake species and four frog species over the course of the afternoon. I'm planning to return on a warmer day in hopes that more massasaugas will be out, but that will have to wait. After the early March heat wave, temperatures dropped to relatively normal cool over the last few weeks here in Michigan. It has been in the low 50s during the day and in the 30s at night with rain and clouds almost every day. That was until yesterday, a large storm system moved through early in the morning and sun came out in the early afternoon and caused temps to rise quickly into the low 60s. Because I only have one morning class on Tuesday, I decided to swing to one of my favorite sites not too far from campus in hopes of seeing some basking snakes. The clouds were just clearing when I arrived around 1:30 in the afternoon and I was fairly confident that I would find my quarry. I spent most of the afternoon exploring this type of habitat. Many of these open fields and prairies are the result of selective harvesting events many years ago on state game areas like this one. 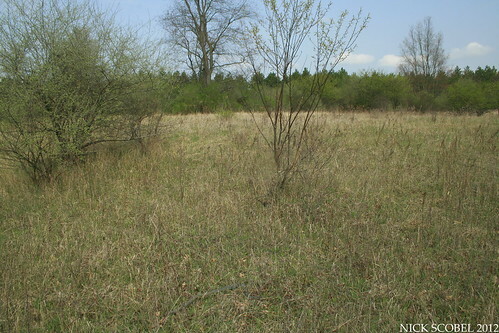 These open, barren habitats create a mosaic of forest and field with lots of edge. This type of area is one of the favorite haunts of the Blue Racer. It didn't take very long for me to hit paydirt as I spotted a pair of racers basking side by side in some fairly heavy cover. One of the snakes made a hasty exit and can be seen exiting the left side of the photo, the second snake quickly followed and disappeared down a rodent burrow before I could get a better look at it. 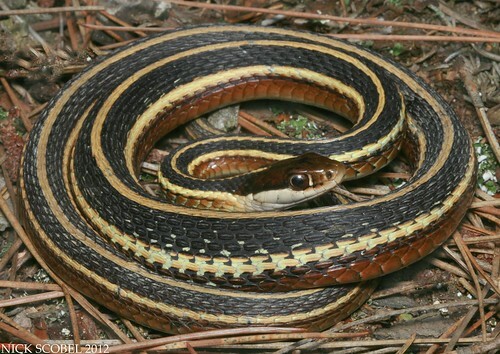 I did find this healthy adult ribbon snake active nearby though. This was a healthy adult with a noticeable meal, probably one of the many Spring Peepers that were calling in a small marsh nearby. After splitting ways with the snake, I kept working the edge areas of the field in hopes of seeing another racer basking. As I moved out into the more open area of the field, I noticed this monster laid out a few feet ahead of me. 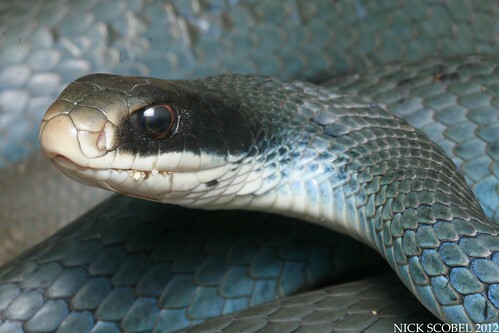 Even though it was a large snake, you can see that Blue Racers can be tricky to spot even when they're right out in the open. 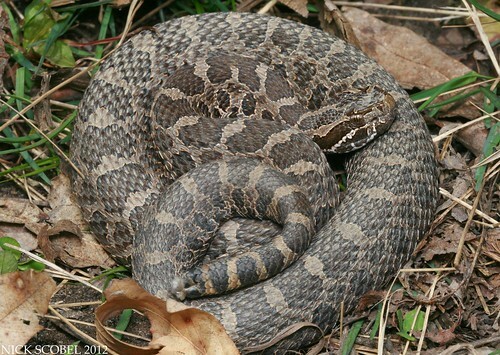 The snake can be seen in the lower center of the photo. After a short chase I was able to get this snake corralled for some photos. It was surprisingly relaxed for this species and did not even attempt to bite once. This is probably the largest specimen of this species I've ever seen, well over the five foot mark. It was hefty and had a bunch of scars and scratches on it which I'm sure tell a tale of a long life. A lot of years are required for an individual of this species to reach this size in the northern part of its range and the calm, content disposition of the snake was probably a reflection of an old fella that just wanted to go about its business. I was happy to find such an impressive snake and hope this snake enjoys a few more years of life in this area.